Where did the peas go? It’s been a long morning and Sue is walking to the cafeteria. Her eyes glance over all the choices on the menu. She picks up her tray, a Styrofoam compartmentalized plate which she actually enjoys. After all, the peas cannot touch my mash potatoes! She can smell the garlic potatoes and the vapors from the sweet carrots make her mouth water. She is going a little light on her lunch so she chooses the roasted lemon pepper chicken. Add some peas and she is just about done. She realizes that a little piece of cornbread never hurt anyone, so on her plate it goes. Her plate looks so good and colorful. She can’t wait to sit and begin to enjoy this feast. Because time is limited she takes her lunch to go and covers it with the clear plastic lid. People are moving back and forth, everyone ready for their lunch likewise making choices and piling food on their plates. As she begins to walk back to her office from the cafeteria she greets those that are passing by. She bumps into Sally. Sally just started working there, a college friend from years back. As she goes to greet her, her hand slips and her lunch tips over and lands on the floor. Luckily the lid held it together. Unfortunately, what was once separated had become one big pile of multi-color, textured mush! She can’t tell where the potatoes begin and where on earth did the peas go? Life is hard. We have so many choices and decisions along the day; it’s difficult to hear the birds singing. 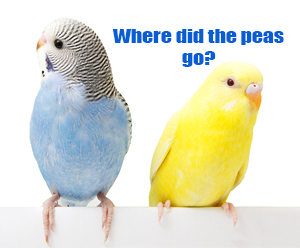 If we are tired and worn out, the birds actually sound annoying. What a shame! As I take a back seat in this time in my life, I can see how every day activities can become stressful. I’m challenged by disease in my body and taking a time of rest is starting to cause me to gain strength and direction once again. Life can seem like the lunch line. Well, life is more like the toppled tray. Everything is mixed together. We try to make sense of the days “to do list” and it seems we are not making progress. Add a little stress from sickness or family dynamics and we seem to be going backwards instead of progressing in this beautiful life we have been given. I’ve learned and continue to assess that sometimes de-compartmentalizing all my thoughts and challenges give me a better opportunity to glance from afar what is actually going on in my life and in my head. Writing down all that has to be done and breaking it down into smaller assignments for myself, gives me a more tangible approach and even better success in accomplishing the things of life. After all, we can’t just stick our head in the sand and act like life and its intricacies don’t exist, right? Moms need a break. Dads need a break. Young adults are overwhelmed as pressures seem to pile up. Doctors, teachers, and preachers, we all need to live in this fast-past world. But we must learn to sit and breathe. Often, I sit and dialogue with the Lord as I make lists. And if somehow all does not get done (that’s everyday), well tomorrow is a new day! I’ve said it before; we must jump off the “hamster wheel”. Life is a gift and it is precious. His grace is sufficient. Let’s embrace life and enjoy the breath he has given us today. It’s Practical | Make a list. Ex: Short-term goal vs. long-term goal.Weekly household chores.Today vs Tomorrow. Personalize it for you! Don’t forget to listen to the birds. They sing beautiful songs and are never stressed about where their next worm will come from! Today I want to share a word of encouragement to the “caregiver”. In the Scriptures we read about a man named Ziba. Many may not even know who he is. Ziba was a caregiver, perhaps a manager of the affairs of Mephibosheth. Mephibosheth was the son of Jonathan. Jonathan was the son of King Saul. When David became king he wanted to show kindness to anyone left in Saul’s lineage for the sake of Jonathan, his friend. Sometimes it seems overwhelming when we are the caregiver. Our loved ones need care and we step in. We can get very tired, run out of energy as we try to make those we love comfortable. We want to meet their needs and assure them that they are loved. We become their hands and feet; even the hands and feet of Jesus as we serve them! Whether it's taking care of a parent, child or friend we expend our energies on them because of the love that the Lord has given us. We watch the Father and we do likewise. If we are not careful we forsake our own well-being. We must take care of ourselves in order to be a good resource for another. I love how the Lord through David honored this caregiver, Ziba. His responsibility was to take care of Mephibosheth who was crippled in both feet. When David took Mephibosheth under his care, into his palace, Ziba was also brought into the king’s presence along with his family. Everyone received the blessing; a time of refreshment and provision for all. I wonder if Ziba ever became weary? He was probably overwhelmed with fear as well. After all, he is taking care of the grandson of the previous king. In many eyes, King Saul was David's enemy. But David, wanted to show kindness! Don’t give up! God knows and he is the one that refreshes the weary. Look for opportunities to help and be of service to the weak. Jesus himself has humbled himself. He became a servant so that we would follow in his foot steps. Stay on your guard. Let’s not let our hearts become troubled or even bitter. 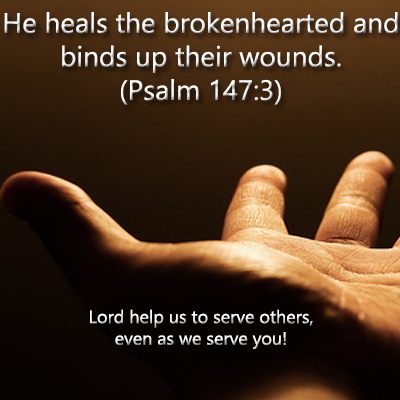 A caregiver requires strength, wisdom and courage from the Lord. God can and will sustain us. Sadly, later we read that Ziba fell into the sin of greed. Guard our hearts and encourage our soul! Lord help us to serve others, even as we serve you! Keep our hearts flooded with joy as we serve one another. If Jesus is the true vine, does that mean there is a false vine? There are other stems that grip and attach themselves. They trail and creep along to see what they can attach themselves too; a means to support their destructive agenda. Not every vine is beneficial and produces well-being. Every vine seeks a place to latch itself; to fasten its grip with tendrils to anything that will allow it to live and thrive. When the vine is Christ, it causes fruit to grow with the Father himself as the Gardner. He provides nourishment from his Word; tends to his own promoting and sustaining life! When the false vine takes its place it grows quickly consuming everything in its path. It moves is a web-like format of confusion and can obscure the surface of what it’s clinging to. It strips even the very identity from its victim, overwhelming the nourishment and life from its target. It leaves an external covering that overshadows the object from being recognized. These vines of confusion are wrapped together with discontentment, misperception, and lies that are just a little off from the truth; nevertheless LIES! When a false vine is detected, it is the Gardner himself that points it out. He will begin the process of exposing it and even asking us to co-labor in the removal and stripping process. Be careful that the vine is not just tossed to the side. Go deep! These vines are resilient and will grow anywhere. They will root themselves on rocks, among thorns and even on top of a garbage piles. If we let them, they will even lodge themselves on good soil and bring destruction, a state of confusion that will cause us to elude the truth we know. They must be completely destroyed. 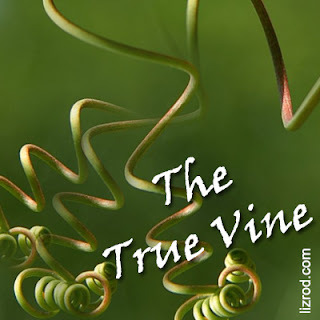 The TRUE VINE prunes carefully to produce life and encourages new growth. It seems painful and even questionable at times, but the fruit is the evidence that the “cut” was needed. Cling to the Truth! Uproot what is false. The Truth hurts, but it brings life!